A small turnout of 5 boats only managed 8 races due to the light and fickle NW winds. 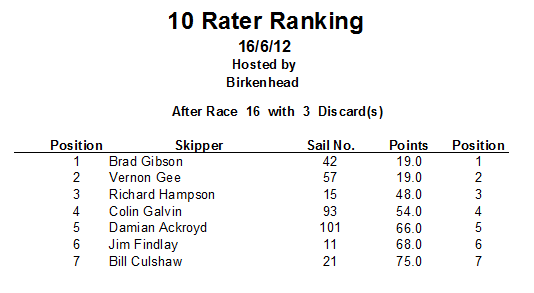 A fleet of 7 boats competed for the Northern District 10 Rater Ranking event held in gusty conditions from the SW. After 16 races, a count back down to 3rd placings gave Brad the narrowest of wins over Vernon Gee who was consistent over the full day with his Trident design 10 Rater. Thanks go to Victoria, Bernie and Andrew for running the days racing. A reminder to all members that this coming Saturday 16/6/12 is a 10 Rater Ranking/Open Race and that the start time will be 10am sharp. Please ensure you bring along your current certificate and your £4 entry fee. Any skippers not sailing who can give us a few hours of their time would very much be appreciated.